Benetton B-United Jeans for Women is beautifully feminine, sophisticated and sensual. 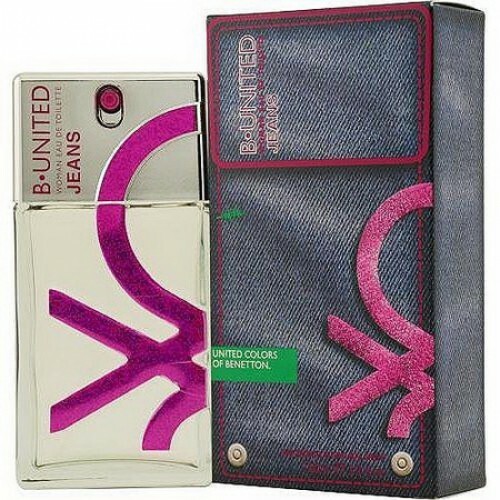 Benetton B-United Jeans for Women 100ml. Eau De Toilette - This ladies, floral-green fragrance is beautifully feminine, sophisticated and sensual. Benetton B-United Jeans Woman will give you a healthy self-confidence and audacity light. Fragrance was launched in 2007. Head : mandarin, red currant, green basil. Heart : Egyptian jasmine, cyclamen, narcissus. Basis : sandalwood, amber, musk. The company Benetton Group was founded by four brothers in 1965. The company is developing dynamically and shops with colorful clothing has gradually expanded throughout the world. Offer it includes not only clothing and fashion accessories. Its range expanded to include home accessories and perfumes. All style colors, stylish elegance and exceptional creativity. Fresh style Benetton, which combines nature and uniqueness, became the inspiration for a number of perfumes of this brand.